iPhone owners have had some good music-making tools at their disposal for some time, but those apps have always played second fiddle to the much more powerful examples available for the iPad. Now the gap is closing thanks to some excellent recent releases. Japanese musical instrument veteran Korg is leading the charge with a couple of fantastic apps. Module, which we’ve covered before, turns your iPhone into a powerful, expressive instrument. Just attach a musical keyboard and away you go – you could play a concert with it, it sounds that good. Then there’s the new iDS-10, a reworking of an app Korg released for the Nintendo DS in 2008. Featuring a drum machine, two synths and a vocoder that allows you to add a robotic version of your own voice to songs, iDS-10 is the best combination of advanced music-making and simple workflow I’ve yet seen on the iPhone. The only problem with iDS-10 is that it’s looks are based on the old 1970s Korg MS-10 synth. Basically it looks ugly and uninspiring by modern app standards. That’s not a problem that Auxy has. After launching on the iPad last year, this good-looking, great-sounding, easy-to-use music-making tool has launched as an iPhone version today. 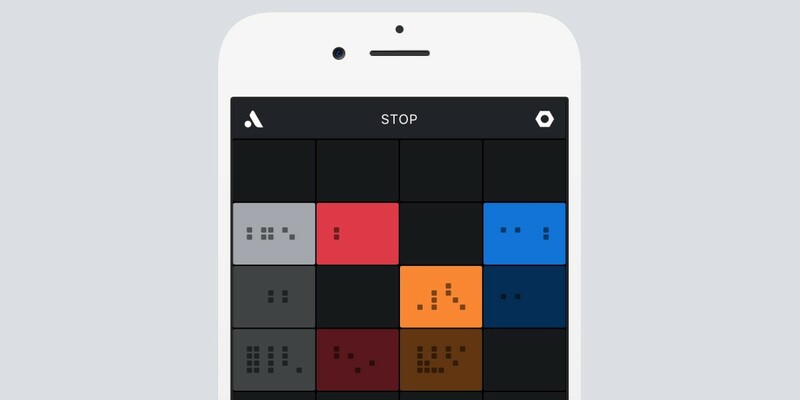 The app gives you four instruments – a drum machine, a bassline and two other synths. There are a bunch of preset sounds you can choose from for each, and they all sound really good. No, really good. You can even dig in and edit each preset to your own tastes, with sliders for sound ‘character,’ a filter and (limited) effects. The basic interface is easy to grasp, and everything stays in the right key as you enter notes into each instrument’s grid. I picked the interface up in about five minutes and produced this little ditty – it’s not a track that’ll get me to number one in the charts, but to say I made this on my phone in no time at all, it reflects well on Auxy. There’s an in-app record function, and you can export your masterpieces to Auxy’s own server to quickly share with the world. You can also send them to Dropbox, email and all the usual destinations if you want to work with the files elsewhere, such as in your desktop digital audio workstation. I ran my track through Landr’s mastering app, but that was it. Auxy’s mission is to bring mobile music making to the masses, with accessible, great-sounding tools. It’s certainly achieved that on the iPhone.